Heidelberg can be easily reached from Frankfurt International Airport (FRA) in less than one hour by Airport shuttle buses or train connection. 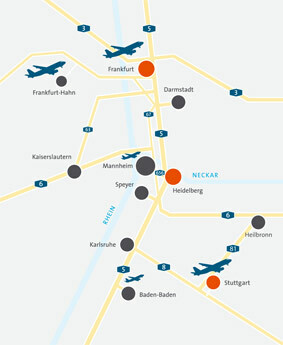 The diagram at the right illustrates the relative locations of airports near Heidelberg and Mannheim. From European airports of departure you also can reach Heidelberg via budget airlines through Airport Karlsruhe/Baden-Baden (FKB) (about 90 km away) or Frankfurt Hahn Airport (HHN) (about 150 km away). Further travel information could be found at the Heidelberg Tourism website. Send an email to Christina Blach giving the postal address you want the invitation letter to be sent to. We kindly recommend you to contact us early in advance, as the conveyance of your letter may take some time. Attendees are responsible for arranging their own accommodations. We urge you to make your hotel bookings as soon as possible. Heidelberg is a major tourist attraction in Germany and July is high tourist season for Heidelberg. Hotels fill early. We have reserved a number of rooms in different Heidelberg hotels for the timeframe July 14th to 20th, 2019 that are available on a first come, first served basis. Costs are approximately 80€-120€ per room and night, depending on the room size. Wireless internet access in the rooms is available (usually free of charge). This rooms allocation is valid until 17 May 2019. When booking, please mention “Combine”. This rooms allocation is valid until 10. June 2019. When booking, please mention “Combine”. This rooms allocation is valid until 14 May 2019. When booking, please mention “Combine”. This rooms allocation is valid until 3 June 2019. When booking, please mention “Combine”. This rooms allocation is valid until 14 June 2019. When booking, please mention “Combine”. This rooms allocation is valid until 27 May 2019. When booking, please mention “Combine”. This rooms allocation is valid until 15 April 2019. When booking, please mention “Combine”. This rooms allocation is valid until 7 July 2019. When booking, please mention “Combine”. This rooms allocation is valid until 30. June 2019. When booking, please mention “Combine”.